The players first and last name needs to be spelled exactly how it is on their US Club passcard. Once you find the player click on the “add” button. 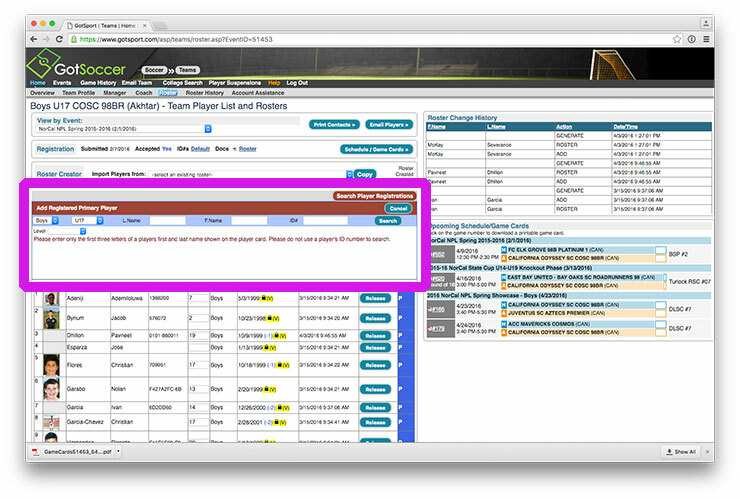 If the player is still not found, make sure all your players are on a "NorCal Premier League Roster" in addition to being on the "Official Roster" in the US Club/KYCK system. Click here for direction on how to check your US Club/KYCK account. If you add any players to the US Club/KYCK rosters, it will take up to 24 hours for the player to be available on GotSoccer for your event rosters.